Recent news is correctly focused on the very high corrosivity of Flint River water (without any inhibitor) for lead plumbing, and the likelihood that the resulting higher lead in water is associated with increased blood lead for Flint’s children. However, iron corrosion is also a major problem, and herein, we report our final experimental results on this issue. Corrosion in general, and iron corrosion in particular, is the most expensive problem that water utilities face. Rapid iron corrosion can easily cause tens of millions of dollars’ worth of damage per year to Flint’s water mains, so we wanted to examine how bad the problem was. Hypothesis: It was hypothesized in our National Science Foundation (NSF) proposal, that Flint River water alone would be about 5 times more corrosive than Detroit water. However, no corrosion inhibitor was added to Flint River water, which could make the difference even greater. Morever, certain bacteria that can speed up corrosion, can grow in pipe systems, and essentially cause iron pipe to be “eaten up” faster than without these bacteria. This is called Microbiologically Induced Corrosion (MIC). During our field sampling a month ago, we looked for MIC bacteria in the Flint system versus samples from Detroit, to see if there were problems due to MIC bacteria. Result #1. Head to head comparison of iron corrosion in Flint River vs. Detroit Water. We previously demonstrated that rapid iron corrosion in Flint River water was eating up the chlorine disinfectant, and causing much more iron release than in Detroit water. We continued the same test for a month, exposing steel samples (a nail that is 99.99% iron) to: 1) Detroit water, 2) Flint River water, and 3) Flint River water plus orthophosphate (a known corrosion inhibitor). The water contacting the steel was changed every Monday, Wednesday and Friday. After a month, we photographed the iron samples, and measured weight loss. Each experiment was conducted in groups of three (triplicate) so we could estimate the corrosion rate with statistical confidence. There was much more rust on the nail exposed to Flint River water compared to Detroit water (Figure 1). This gives you an idea why General Motors had to stop using Flint River water, because it was eating up metal on their assembly line. Figure 1. 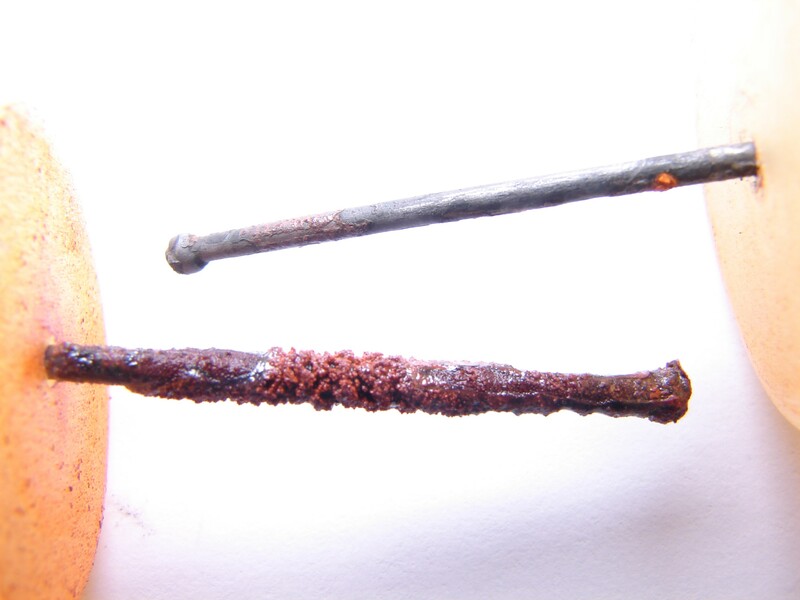 Illustrative photograph of a nail after 1 month exposure to Detroit water (above) and Flint River water with no inhibitor (below). Each nail was rinsed in flowing water before taking the picture. The weight loss measurements of the nail were used to determine the rate at which the water ate away at the steel, and verified scientific theory and our experimental hypothesis (Figure 2). Flint River water is more corrosive even with phosphate added than Detroit water (which has phosphate). 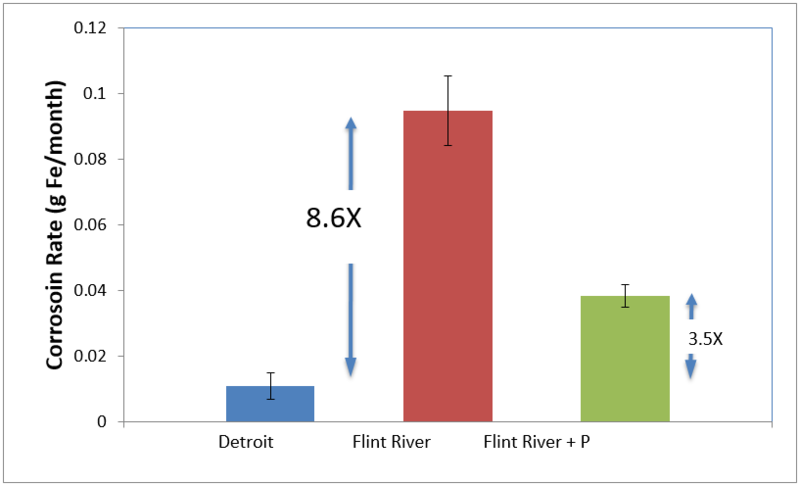 In fact, Flint River water plus phosphate had 3.5 times more weight loss than the Detroit water, which is reasonably close to the theoretical prediction of 5X more corrosive noted in our NSF proposal (Figure 2). Theory says this is due to the higher levels of chloride and sulfate in the Flint River water than in the Detroit water. If an orthophosphate corrosion inhibitor was being added to Flint River water, in the last 16 months the city pipes would essentially have aged about 56 months (56 months = 3.5 faster corrosion X 16 months) more than if Detroit water was used. Unfortunately, the Flint River water was added to the pipe system without any phosphate inhibitor. In our tests, this condition was 8.6X worse than Detroit water (Figure 2). Assuming this rate applies to the actual city pipe system, the last 16 months on Flint River water would have aged the pipes about 138 months (138 = 8.6 X 16 months) or 11.5 years more than using Detroit water. This could easily be costing citizens of Flint millions and millions of dollars in future pipe repair costs (see later discussion). Figure 2. Iron corrosion rate based on weight loss after 1 month in Detroit, Flint River, and Flint River water plus orthophosphate (1mg/L as P). Result #2: Microbially Induced Corrosion (MIC). The above results are bad enough, but they do not consider problems caused by bacteria that can further accelerate metal pipe corrosion. 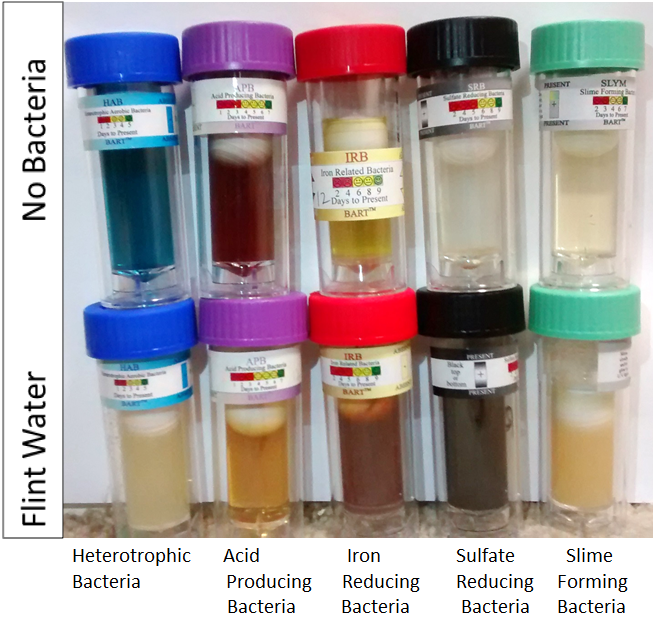 When we went to Flint, we brought Biological Activity Reaction Test (BART) kits to look for specific MIC bacteria including: heterotrophic aerobic bacteria (HAB), acid producing bacteria (APB), iron reducing bacteria (IRB), sulfate reducing bacteria (SRB), and slime forming bacteria (SLYM). As a scientist, it is fun to do these tests, because when the bacteria grow one can see colors either appearing or disappearing to indicate that they are present (Figure 3). Depending on how fast the color changes, one can also roughly tell how much of each bacteria type are present—if there are more bacteria the color changes more quickly. For example, HAB tests have a color blue without bacteria (upper left Figure 3) and it will turn clear if bacteria are present and grow (lower left Figure 3). Or the SRB test bottle is clear if there are no bacteria (upper black cap bottle Figure 3) and will turn black if the bacteria are present and grow (lower black cap bottle Figure 3). The key point is that all types of corrosion causing bacteria were found in the Flint system (comparing top bottle with no bacteria to bottom bottle from Flint tap water of the same color cap). This is probably due to low chlorine, but might also be due to Flint River having a lot of organic matter (or “food”) for bacteria in it. We took a few samples of Detroit water, and the levels of corrosion causing bacteria were much lower. Figure 3. Bacteria tests from right to left for HAB, APB, IRB, SRF and SLYM. The top bottles show what no or low levels of bacteria look like. The bottom bottles (all from the Flint system) show a color change indicating the corrosion causing bacteria are present. We cannot say for sure that these bacteria were not in the Flint system at high levels if the Detroit water was still being used. But we strongly think that there would have been a lot fewer of them. In general, it is believed that the more MIC bacteria you have, the more problems you will have with excessive iron pipe corrosion. So the earlier estimates of corrosion rate, as bad as they are, might even be worse in the real Flint system when the bacteria are present. As a “back of envelope” illustration of how expensive corrosion is, let’s do some math that is grounded in some real numbers. It has been estimated that it would cost about 1.5 billion dollars to replace all of the pipes in the Flint distribution system. Assuming that cost can be (optimistically) spread out over the next 50 years, the cost per year to Flint residents would be 30 million dollars per year. Assuming there are 30,000 ratepayers, this translates to about $1000 per rate payer per year ($83/month per ratepayer). So right away, you get some insights, into why water rates are so high in Flint! But now, instead of spreading that payment out over 50 years, it might have to be spread out over only 38.5 years (50 yrs – 11.5 yrs = 38.5 years) because of the corrosion damage done and pipes failing sooner. Remember, we have aged the system 11.5 years or so in just 16 months. This would mean that pipe replacement costs would have to go up to about 39 million a year just to keep up with failures. Thus, costs to ratepayers would be $9 million extra per year for the next 40 years, because of the extra corrosion that occurred by Flint River water without inhibitor. While this is a very crude analysis, it does illustrate why corrosion problems not only endanger public health, but they are also extremely expensive. Every dollar spent on corrosion control usually saves at least $5-10 in damage, and future repair costs at a typical utility. For Flint, it is quite possible that the damages from corrosive water could ultimately be in the range of a hundred million dollars or even more. On top of that, this analysis does not consider damages to consumers plumbing, which tend to be even more expensive. This is a serious problem indeed, and casts the initial idea that switching to Flint River water would save money in serious doubt. In fact, it is highly likely that the switch will end up costing future citizens of Flint, millions and millions of dollars.